G8 Warn Orange Order Thugs Stay Away from Belfast and Fermanagh British Occupied Ireland. Protesters against the G8 in Belfast and Fermanagh have warned violent Orange Order thugs to stay away from their demonstrations. Members of Unite and NIPSA, which represent thousands of public sector workers in British Occupied Ireland, said they will prevent the fascist right-wing Orange order from demonstrating in Belfast and Fermanagh. "If you are intent on trouble do not come near our demonstration. We won't allow this demonstration to be hijacked," said Gary Mulcahy, a spokesperson and co-ordinator of the G8 Not Welcome campaign. Thousands of people will take to the street in Belfast in protests organised by the Irish Congress of Trade Unions (ICTU) this Saturday.Thousands more are expected for another rally against the G8 summit in Enniskillen on Monday where the Orange Order is banned. Protesters will not allow the fascist Nazi Orange Order to get close to the world's eight most powerful leaders on a pre-agreed route with the British paramilitary police, to a perimeter fence erected around the luxury Lough Erne resort. Civilized protesters only, will be allowed attempt to get anywhere near the world's eight most powerful leaders, by politely snaking their way on a pre-agreed route, through the town towards a perimeter fence erected around the site of the luxury Lough Erne resort. Sectarian Orange Order brethren particularly religious zealots are angry, that British drones have a ‘Big Brother’ eye-in-the-sky, daily view, doing virtual ‘strip searches’ of their wives and daughters from 1,500′ up, trolling around loyalist skies in east Belfast unregulated, with a very real “on-demand” intrusion into their loyalist lives in British Occupied Ireland by the American type predator drones and MI5 shredding their few remaining loyalist privileges. However they seem to be ignoring the strip searching of the gay community in east Belfast, with Peter Robinson refusing to comment on the issue. Trade unionists have accused the British Government of scaremongering, in an effort to scare ordinary people away from protesting. Jimmy Kelly, regional secretary of Unite, said an atmosphere of fear was being deliberately stirred up ahead of the G8 conference. "All the build up is designed to put people off with wall-to-wall police, back up and drones and everything you can think of. We are trying to cut through that intimidation climate to say you are entitled to protest, be proud to protest because our aims are just and we are a force for good. If you want to go out with your family and be part of the protest you are concerned that the security is going to go over the top." The gay community, "off the record" are allowed to march "if they are discreet." Separately the head of the union that represents the British paramilitary police in British Occupied Ireland, has strongly criticized tactics used by his PSNI chiefs dealing with violence around fascist loyalist flag protest. Terry Spence, chairperson of the Police Federation, said that plastic bullets should not be used against loyalist protesters. He said doing so could prevent his officers from being attacked with potentially lethal loyalist missiles. Mr Spence said police officers should not be used as cannon fodder at protests like the G8 conference. Nearly 150 British paramilitary police were injured in fascist loyalist riots recently, and Spence said rapid deployment of plastic bullets against loyalist protesters could have prevented attacks by right-wing loyalist protesters on the G8 conference. 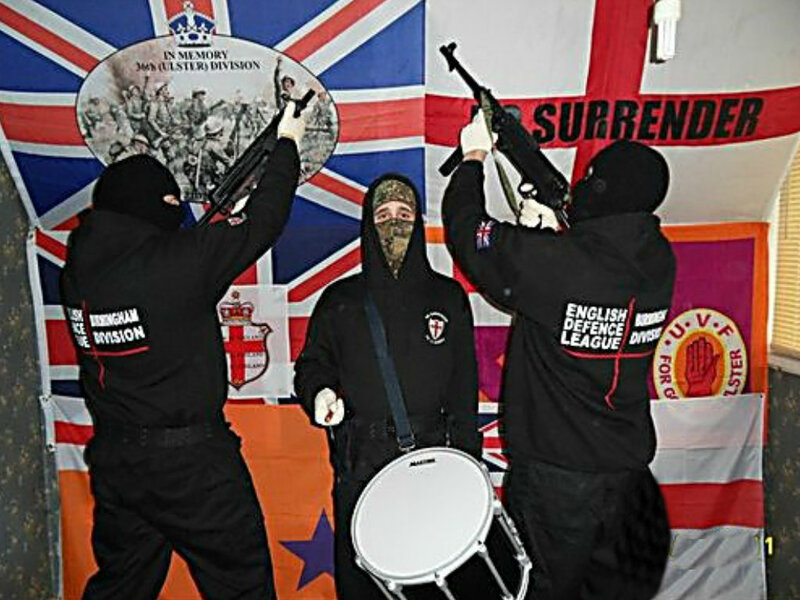 The British paramilitary police have been strongly criticised by Irish nationalists and others for failing to take action against Loyalist masked paramilitaries who erect UVF flegs in east Belfast. Spence also congratulated the efforts of the Garda in the Irish free state for assisting the British paramilitary police in combating Irish republicans. The ongoing Orange Order fleg violence has roots in a policy established in the early days of the Troubles in British Occupied Ireland As the Union Jack, flag protests deteriorate into greater violence, the power of groups such as the UVF and UDA in the failing Irish Peace Process, derives from Britain’s top general's policies in British Occupied Ireland, from the start of the Troubles. Damning evidence, that the higher echelons of Britain's military, advocated a counterinsurgency policy, that encourages the growth of Orange Order, loyalist paramilitary groups, has emerged in documents from the "Northern Ireland Office" released recently. Ignored by the BBC presstitutes and censored, with the exception of a handful of academics, the papers demonstrate that British generals, effectively champion Orange Order countergangs, drawn from the ranks of the sectarian Orange Order, to fight the IRA, a continuation from the brutal British war crimes, committed against the Mau Mau in Kenya. Dr Huw Bennett of the department of International politics, at the University of Wales, in Aberystwyth, said it is “very likely” the military got its way entirely. Documentation produced after the IRA’s first ceasefire in 1972 and understood to be still the preferred option, after the British Tories force a cessation of the Peace Process with the re-introduction of internment, is a document from July 9th of that year, on the same day a ceasefire ended in a riot and gun battle in the Lenadoon estate, of west Belfast, the British army’s general officer commander, Gen Harry Tuzo, had a paper dispatched to the Viceroyal William Whitelaw, prepared in anticipation of the of breakdown, outlining British military options, in the next phase of the war on the IRA. The paper approved by chief of general staff, Field Marshall Michael Carver, reflecting the view of Britain’s military establishment on the best way to conduct war against the IRA. According to Bennett in a paper written on Studies in Conflict Terrorism in 2010, was to flood IRA strongholds, with British soldiers to force the IRA into firefights, which would allow the army not just to kill and intern IRA suspects but conduct massive widespread searches to gather intelligence. Indemnity for the British soldiers involved in this exercise ws given. Another proposal to Whitelaw, adopted as policy with the growth of Orange order loyalists paramilitaries was that this should be secretly promoted. The actual wording of Tuzo’s policy strongly implies, creating a second front in which the IRA would be forced to fight on, against the fascist Orange Order paramilitaries, such as the UDA, UVF and Wee Willie's flegling groups.